David Beckham Gets New “Pretty Lady” Neck Tattoo for Harper! Just days after showing off his new “99” pinkie tattoo, David Beckham revealed another new piece of ink, this time as a tribute to his four-year-old daughter, Harper. 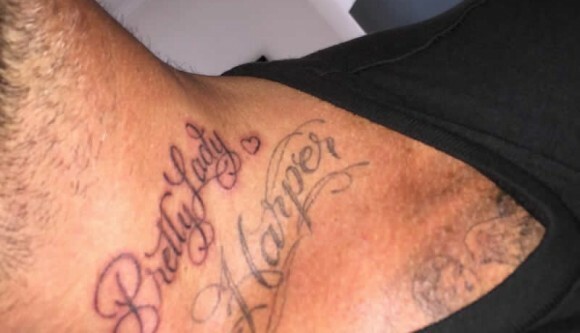 David Beckham is all about getting tattoos in honor of his loved ones, and he is now the proud owner of a “Pretty Lady” tattoo inked with a tiny heart on his neck, just above the “Harper” tat he had done on his chest back in 2011, the year his first and only daughter was born. David’s new tattoo is inked at the base of the left side of his neck, in a scrolling black script font that matches his original “Harper” tattoo perfectly. David Beckham debuted his new “Pretty Lady” tattoo on July 26, captioning an Instagram snap of the sweet ink: “Hey Pretty Lady. Just adding to the collection of tattoos that mean so much to me…Thanks Mark as always looks amazing.” The football star and father of four also included in his Instagram caption a shout-out to Shamrock Social Club, so we’re going to assume that David Beckham’s tattoo was inked by the famous Mark Mahoney, owner of the Hollywood-based tattoo shop that has inked the likes of Ellie Goulding, Kelly Osbourne, Drake and Zayn Malik. We think it’s pretty sweet that David Beckham, quite possibly one of the most famous soccer players of all time, has such a soft spot for his little girl, and we love that he got a new tattoo to mark Harper’s fourth birthday. What do you all think of David Beckham’s new “Pretty Lady” neck tattoo? ?